Petteri Orpon puhe Brys­se­lin Kansal­lis­seu­ran Kokoo­mus 100 -gaalassa. Thank you for this oppor­tu­nity to speak at the famous BKS gala dinner! BKS S is one of the most dyna­mic member orga­ni­sa­tions of Kokoo­mus. You bring toget­her Brus­sels based Finns and friends of Finland across party lines. Besi­des gala dinners, BKS orga­ni­ses high quality semi­nars like the one this week for Kokoo­mus 100th anni­ver­sary here in Brus­sels. You are the front­line of Finland and Kokoo­mus in EU poli­tics. I am so proud of the work you do! I want to congra­tu­late the new Presi­dent of BKS, Pete. I wish you all the best! I also want to thank Marketta, for her commit­ment and work for BKS. Last year we celebra­ted Finland’s hundred-year anni­ver­sary. Among all of the states of the world, Finland is a unique success story. In the begin­ning, Finland was a small and poor country, loca­ted deep in the North. Today, Finland is one of the wealt­hiest nations in the world. This year UN named Finland as the happiest country. Kokoo­muk­sen arvot sivis­tys, mahdol­li­suuk­sien tasa-arvo, työ ja toime­liai­suus, yksi­lön vapaus, demo­kra­tia, oikeus­val­tio ja kansain­vä­li­syys, ovat kestä­neet koko matkan Suomen itse­näi­syy­den alusta tähän päivään. Kokoo­mus on totta kai kehit­ty­nyt ja edis­ty­nyt ajat­te­lus­saan matkan varrella. Sata vuotta sitten emme saaneet kunin­gas Väinö ensim­mäistä, ja ehkä hyvä niin. 2010-luvulla saimme kuiten­kin Sauli Väinä­mön. Finland has been a member of the EU for twenty-three years. We have used euro as currency for sixteen years. Over fifty-five thousand Finnish students have been on Eras­mus exchange, like Jyrki and many others in this room. Over the past twenty years, we have had over seventy thousand Euro­pean students on Eras­mus exchange in Finland. Being Euro­pean and being part of the EU is part of our every­day lives. Finnish people support Euro­pean inte­gra­tion. We unders­tand that it is impos­sible for nation states alone to solve today’s complex chal­len­ges. Still, it is good to remind oursel­ves from time to time that the EU members­hip is so much more. We chose the side of democ­racy, human rights and the rule of law. EU members­hip was a secu­rity choice as much as it was econo­mic choice. The choice was also about common sense. Our conti­nent faces chal­len­ges that cannot be resol­ved by each state acting alone. None of the EU member states is big enough. We need each other. In recent years, certain member states have under­mi­ned the rule of law principle. Finland, Kokoo­mus and I do not accept this. Rule of law is one of EU’s core values. If you don’t like our common values, you shouldn’t get the common money either. Foste­ring the rule of law should be a precon­di­tion for recei­ving EU cohe­sion funding. Next spring will be an exci­ting time for the EU. We will elect a new Parlia­ment and we will choose the new Commis­sion. It is a begin­ning of a new era. It is crucial to assess what we have achie­ved so far and reflect on what the EU should focus on next. Big on big things and small on small things still applies. To me, big things are research and inno­va­tion, sustai­nable growth, secu­rity and defence coope­ra­tion. Peace and pros­pe­rity. To me, small things are strict rules on how farmers should conduct their day-to-day busi­ness. Let them decide them­sel­ves. With no doubt, climate change is the biggest chal­lenge of our time. With no doubt, migra­tion has the poten­tial to tear the EU apart. Outside actors would be happy about this, but it is not in the inte­rest of any EU member state. Miti­ga­ting climate change and mana­ging migra­tion are the issues, in which the EU needs to deli­ver. Global warming is happe­ning even faster than we expec­ted. We should set the EU Climate Policy Head­line Target to fifty percent instead of forty percent. The Nordic expe­rience shows that it is possible to reduce emis­sions and still have healthy econo­mic growth. We should see sustai­na­bi­lity as oppor­tu­nity, not as an obstacle. Mana­ging migra­tion requi­res massive measu­res from the EU and from us, the member states. It means more deve­lop­ment coope­ra­tion, crisis mana­ge­ment, private invest­ment, trade and bila­te­ral coope­ra­tion in gene­ral. The EU needs a better common asylum policy. The EU’s exter­nal borders must work effec­ti­vely and secu­rely. The legal ways of entry must be in order. If the EU does not succeed in this, there will be more poverty, conflicts, refu­gees and radica­li­sa­tion. Euro­peans support the EU as long as the EU does rele­vant things. We need to convince Euro­peans on EU’s ability to deli­ver on the most critical issues such as climate change and migra­tion. Next year, Finland will be the Presi­dent of the EU Council. Finland has to take its presi­dency ambi­tiously. EU is not an object of lobbying. We are the EU. Finland would lose most if the EU would weaken. Finland has never been as inde­pen­dent as a member of the EU. 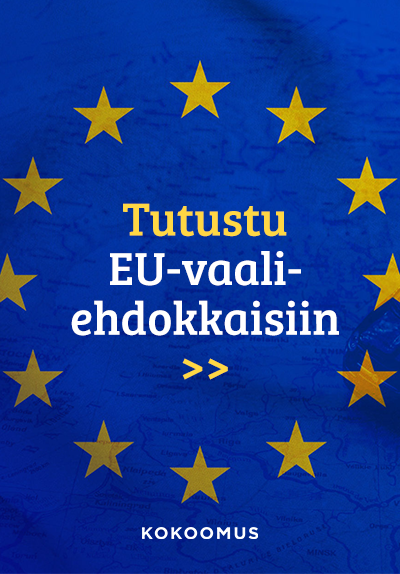 Kokoo­mus supports the Finnish EU members­hip as much as we did in the begin­ning of the nine­ties. We were the first Finnish party to support Finland’s EU members­hip. Members of Kokoo­mus were the key nego­tia­tors, when Finland joined the EU. We want to make the EU stron­ger and more united. The EU we pursue provi­des more secu­rity and pros­pe­rity for its citizens than each member state alone. Kokoo­mus can take up the Finnish EU presi­dency and run it ambi­tiously. We know how to make an influence in the EU. We have the agenda and we have the connec­tions. 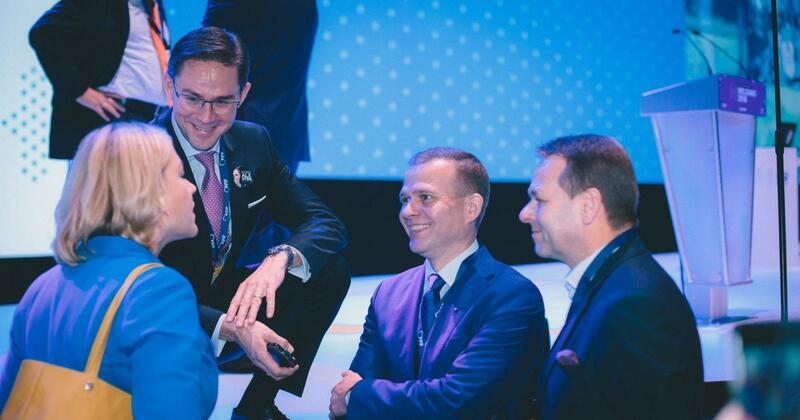 Kokoo­mus is the most pro Euro­pean party in Finland. Of course, we need to have the Prime Minister’s seat to lead Finland’s EU policy. That is what we are going to do. We are going to win the elec­tions next spring. And we will do it by trus­ting the Finnish people. Saa tehdä –Suomessa me luotamme suoma­lai­siin. Annamme heidän toteut­taa ja kehit­tää itse­ään, yrit­tää ja mennä eteen­päin. Kokoo­muk­sen Suomessa sosi­aa­li­turva kannus­taa otta­maan vastaan työtä kaikissa tilan­teissa. Kokoo­muk­sen Suomessa vero­te­taan enem­män sitä, mikä hait­taa meitä, eli saas­tut­ta­mista ja pääs­töjä, ja vähem­män sitä, mistä hyvin­voin­timme kasvaa, eli työtä ja yrit­tä­mistä. Kokoo­muk­sen Suomessa työn­te­ki­jää kannus­te­taan uudel­leen koulut­tau­tu­maan ja kehit­tä­mään osaa­mis­taan. Kokoo­muk­sen Suomessa työelämä on maail­man parasta. Suoma­lai­sissa on niin paljon poten­ti­aa­lia, että kun heihin luote­taan ja anne­taan tehdä, niin Suomi on paljon enem­män. Me tarvi­taan siihen vähem­män sään­te­lyä, byro­kra­tiaa ja ylhäältä annet­tuja määräyk­siä, enem­män vapautta tehdä ja toteut­taa itse­ään. Saa tehdä Suomi on parempi Suomi. Saa tehdä –Suomessa saa mennä ja tulla. Saa kansain­vä­lis­tyä, saa muut­taa ulko­maille, mutta saa tulla myös takai­sin. Kokoo­mus on puolue, joka sanoo: saa tehdä! Thank you for this oppor­tu­nity and I wish you all a great evening. Let’s toast for one hundred years of Kokoo­mus!